This document explains how to perform a Safe Boot in Mac OS X 10.2 or later and how to boot into the recovery partition for OS X Lion. This can help to troubleshoot startup problems when an OS installation disc is not available. A Safe Boot can potentially repair problems that prevent Mac OS X from starting properly. In Mac OS 10.4 or later, you will have to login to your account, even if it normally does so automatically. While a Safe Boot can be helpful for troubleshooting, many services will be unavailable - specifically audio and network devices. To return to a normal boot, simply restart the computer without holding any keys. Generally, since the directory check occurs during the gray startup screen, you can reboot immediately after logging in. NOTE: These procedures are not supported by the Help Desk. These instructions are provided for self help purposes only. Please contact the manufacturer or system developer for help. Potential for data loss CAUTION: Please make sure your important data is backed-up on an external storage device (such as a CD, DVD, or external hard drive) before attempting this procedure. DoIT assumes no liability for data loss that occurs as a result of this procedure. 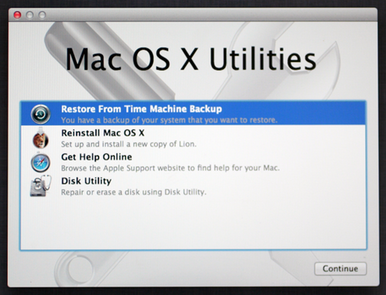 Restore From Time Machine Backup: This option will allow you to restore your entire system, including the operating system, all accounts, user data, and settings, from a Time Machine Backup. Note: In order to use this function you must have a complete backup, including system files, saved on your Time Machine. Reinstall Mac OS X: This option will start the Lion installer. However, to fully reinstall Lion you must be connected to the internet because the operating system files and data have to be downloaded. Due to the size of the operating system this process can take several hours. IMPORTANT: Reinstalling the OS will erase all data on your hard drive. Get Help Online: This option will direct you to the Apple Support website. You must have internet access to use this function. Disk Utility: This option will open your Disk Utility, and will allow you to check, repair, erase, or partition your hard drives. Upon startup, press and hold the command key and the R key until you see the Apple logo. Upon startup, press and hold the option key until you see the Apple logo. Then select the Recovery HD drive. Once you have done this you will be taken to the Mac OS X Utilities screen shown below. Select a tool and click Continue to perform the desired function.